My days are spent speaking with high school students across the country about their lives. In particular, about their interests, college admissions strategies, and life ambitions. It's my passion. 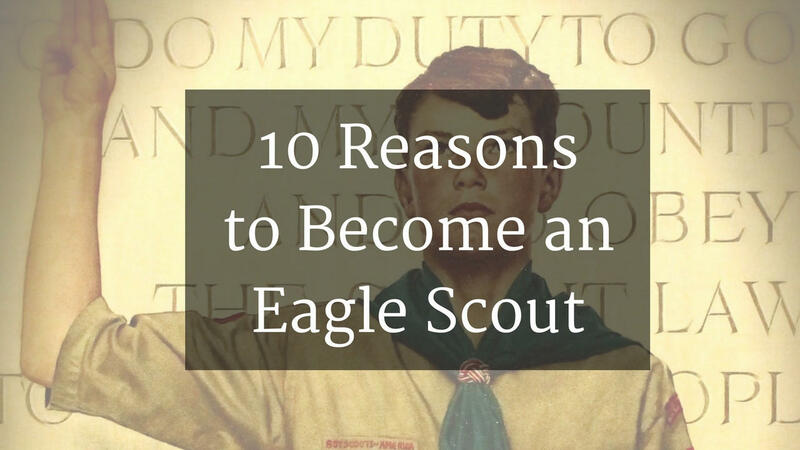 After reviewing (and editing) hundreds of stellar college applications, resumes, personal statements, and college essays, there is one designation that captures the essence of what colleges are looking for in their prospective students - an Eagle Scout. My job as college counselor and mentor becomes much easier when I'm working with an Eagle Scout. I know what it takes to make it through the program and it is not difficult to help Scouts express these attributes within their college applications. Some people believe that colleges give disproportionate credit to Eagle Scouts in the admissions process. I beg to differ - and the 10 items below provide more than enough evidence as to why admissions officers sit up straighter in their chairs when reading the applications of Eagle Scouts. If you have a son who is considering dropping Boy Scouts, please read them this list before they make their final decision. Boy Scouts of America offers over 130 different merit badges that expose scouts to hundreds of new skills, ideas, industries, and careers. These activities provide countless opportunities to investigate and explore subjects that may spark interest (e.g. forestry, metalwork, orienteering, nuclear science, personal fitness, robotics, rowing, theater, electronics, etc.). This exposure is an effective way to introduce a wide variety of topics that may ultimately help with college selection, major preference, or career choice. The path to Eagle Scout challenges scouts to work independently on projects, tasks, and interactions with adults. This self-management skill comes at just the right time in a teenager’s life. Scouts at this age must manage the tension between parental support and self-determination. The curriculum provides countless opportunities that require an advanced level of independent thinking and execution. It is difficult to achieve the rank of Eagle without demonstrating an uncommon level of maturity and independence. The curriculum requires management of multi-month and/or multi-year milestones. This is not a teenagers’ strong suit. Their ability to forecast, anticipate, and plan for the future is often woefully underdeveloped. The continual demand for planning develops this critical skill. Activities such as backpacking and camping require a keen sense of timing and judgment to survive the outdoors. Scouts must master pace count, sunrise/sunset, and other time-sensitive concepts to remain safe. Traditional “scout-led” troops allow young scout leaders to lead weekly meetings and group activities (with close parental oversight). While this may lead to inefficiencies and frustration, it forces the scouts to develop the maturity, leadership, and empathy they will need later in life. Unlike many youth sports teams, Boy Scout Troops tend to be diverse in age, background, abilities, and experience. This diversity creates an even greater social challenge for teenagers who often thrive in environments of sameness. Aspiring Eagles must hold multiple leadership positions during their time in the Troop. These positions demand strong communications skills. There are opportunities to develop verbal skills during troop meetings, open houses, community events, and patrol activities. Writing skills are developed along the way as well: taking and distributing notes from troop meetings, emailing parents or troop members with event updates, and, of course, the paperwork and organization required to pass the Eagle Scout project. While earning various merit badges, a scout is constantly faced with problem-solving challenges: manipulative (knot-tying), perceptual (orienteering), financial (personal management), mental (computer programming), physical (fitness), etc. Longstanding traditions of camping, hiking, and other outdoor adventures provide an endless trove of problems that require solutions. By the time a scout achieves the rank of Eagle, his problem-solving skills will have been put to the test in a wide variety of environments. Meetings and activities require teamwork and collaboration at all levels. In order to succeed, scouts must manage their relationships with peers, young scouts, old scouts, adult leaders, outside organizations, and visiting speakers. This is no small task for a rising teenager. Team dynamics can be further challenged by the fatigue, hunger, and other uncomfortable conditions that often accompany rigorous scouting activities. Scouts who prove to be “team players” under challenging conditions bring great honor to the organization. Troops are often comprised of members from diverse cultures, backgrounds, and communities. Exposure to different cultural beliefs and traditions can expand a scout’s awareness of the world around them. This exposure is particularly impactful for teenagers living in homogeneous communities or attending schools with little diversity. Scout-sponsored international travel also provides opportunities to observe cultural differences and similarities with communities outside the United States. Today, it’s not uncommon for teens to go for years without using their hands to fix, repair, or replace anything. Opportunities to mow lawns, rake leaves, shovel snow, paint houses, deliver newspapers, lay bricks, or work the farm seem to be disappearing. Thankfully, the path to Eagle requires aspiring scouts to get their hands dirty. An Eagle will have achieved an above-average level of manual literacy due to requirements such as knot-tying, knife/ax handling, map and compass work, and other manipulative skills. Earning the rank of Eagle Scout is hard work. There are no shortcuts. It requires a sustained level of commitment – many times in uncomfortable situations or environments. For one scout, it might mean keeping a daily log of income and expenses for 6 months. For another, it could mean maintaining a daily log of physical activity for 30 consecutive days. In each case, an Eagle will have endured countless scenarios that require mental and physical fortitude that they scarcely believed they had. This sustained effort in the face of discomfort and doubt is the type of training that will pay dividends later in life. Enroll in PrepWell Academy to learn how the above skills can be used to succeed in the college admissions process - and beyond. Just over 2 million boys have reached Eagle in 100 years (15,000 a year, roughly). Currently, around 4 of every 100 boys that joins Scouts make Eagle - that's less than 1% of the male population.